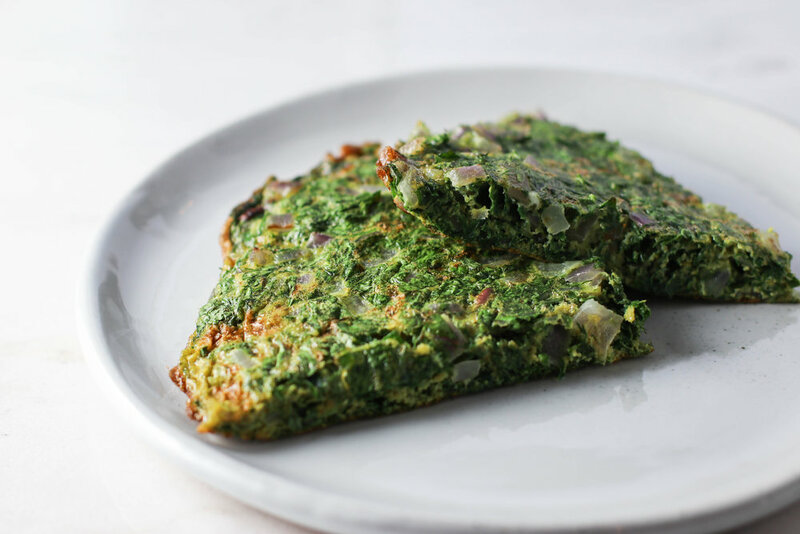 Persian Herb Frittata — Erin Parekh | Live Well, Simply. I make a frittata most weekends - using up all our leftover bits and bobs of produce before hitting the grocery store to restock. We'll add spinach, roasted veggies, scallions, peppers, maybe even a bit of quinoa. But what about adding in heaping cups of fresh herbs?! A few weekends ago, I had a mountain of leafy herbs (parsley, cilantro, dill) that needed to be used up after making a big Mediterranean-inspired spread for friends. I remembered seeing a recipe somewhere for a Persian Herb Frittata - and thinking, wow! that's an insane amount of herbs they're using, wouldn't it be overpowering? Well let me tell you, it's the most delicious and elegant frittata you will ever make. Feel free to use any leafy herbs or greens you have on hand: parsley, cilantro, arugula, scallions, spinach, radish greens, mint, etc. And I think lemon zest would be delicious added in too. Whisk together eggs, turmeric, and sea salt. Fold in herbs and set aside. Heat one tablespoon olive oil in a 10-inch skillet over moderate heat. Add red onion plus a pinch of salt and sauté until translucent and very soft (do not brown), about 10 minutes. Remove skillet from heat and let onions cool slightly. Then, transfer to the egg/herb mixture and combine well. Add remaining tablespoon olive oil to the now empty skillet and return it to medium heat. Pour the egg mixture into the skillet and use the back of a rubber spatula to spread it evenly in the pan. Cook until the eggs just start to set around the edges, about 3 minutes. Place the skillet under the broiler and cool until the eggs are completely set, another 3-4 minutes. The middle should be firm to the touch and the top starting to brown. Transfer frittata to cutting board. Serve warm or room temperature, cut into wedges. This recipe is easily scalable. To serve 4-6 people, simply add an extra cup of herbs, two additional eggs, increase turmeric to 1/2 teaspoon, and add a pinch more salt.